Hey everyone! 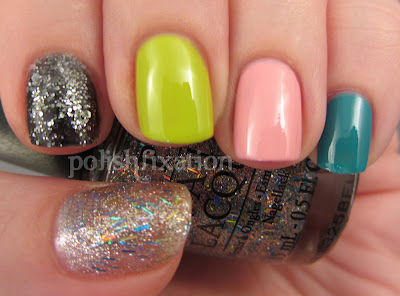 Today I have a really fun mani to share, using all of the polishes in the OPI Nicki Minaj collection! I love all these colors so much! They applied perfectly too. I was really surprised at Super Bass Shatter as sometimes I've heard it doesn't shatter very well. These colors work very well together for skittles, don't you think? Have you tried this collection yet? I really hope you actually wore this mani (on both hands) and didn't just use it for swatching. I love skittles manis and this one is wicked!